Sanford Raymond Thomas Williams was born March 9, 1967 at Esperanza, B.C. to Ray & Terry Williams. His village is located on the west coast of Vancouver Island at a place called Friendly Cove. He is of the Mowachaht Tribe, the place where Captain Cook first visited. Sanford recalls “Even before graduation from high school in 1985, my dream was to become a master in wood carving. 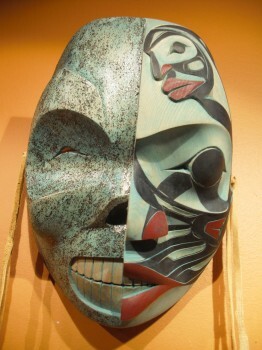 I was influenced by my grandfather, Jimmy John, who was a master carver on the west coast”. In 1988, Sanford completed a two year art course at Kitanmax school of northwest coast Indian art, which is at ‘Ksan in Hazelton. Since ‘Ksan, Sanford has carved masks, ceremonial talking sticks, rattles, plaques, bentwood boxes, panels (5’ by 7’), and several totem poles. Sanford has worked with master carvers Ken Mowatt and Vernon Stephens. A totem pole was donated to the Wilp Si ‘ Satxw healing centre in Kitwanga, B.C., the other was sold in Vancouver. Sanford has also donated a mask to present to the Gitskan Wet’suwet’en Tribal Council.